Cheap Cruises From Seattle - When and Where Can I Go? Alaska cruises from Seattle are available on a variety of ships including Princess, Holland America, Carnival, Celebrity and Oceania. Most offer a 7-day trip to some of the most beautiful places in the state, while Oceania goes one step further and offers a 14 night trip called the ‘Pacific Exploration’ that stops at more ports of call, Prince Rupert and not only cruises the Inside Passage, but the Outside Passage as well. A Carnival cruise to Alaska that will tour the Tracy Arm Fjord or the Holland America offering that also go to Puget Sound are just two of the many itineraries you can choose from, both also include Alaskan stalwart ports of call like Juneau and Ketchikan. These and other cheap cruises from Seattle can bring you Alaska like never before, at a price you didn’t think possible. 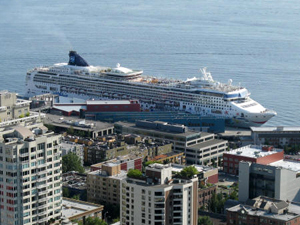 If a week-long cruise isn’t for you, what about a cruise that is only for one night and travels from Seattle to Vancouver? Both Princess and Holland America offer this trip that is more fun than driving and allows you to be pampered onboard a luxury liner if only for a little while. Another great option while in the Seattle area is to check out the Argosy cruises in Seattle Harbor tour. These tours are an hour in duration and take you on a loop around the harbor so you can soak in the atmosphere of the scenic surroundings, check out the amazing skyline and marvel at two different mountain ranges; the Cascade and Olympic all at the same time. They also have lunch tours of longer durations that mix a meal with the history of the harbor. Both are great opportunities to get out on the water whether you are later boarding a large ocean liner or not and live up to the promise of being cheap cruises from Seattle as they start at just $23.50 for adults. Last minute cruises from Seattle can be had on most lines as ships are looking to fill up their remaining cabins, check online for the best deals to be had, or book early for discounts on up-coming cruises so you don’t miss out on the itinerary and line you have your heart set on. Whether you are looking for cheap Alaska cruises or want a one way, one night trip, cheap cruises from Seattle can deliver in style.